Hash browns or hashed browns are a simple potato preparation in which potato pieces are pan-fried after being shredded, julienned, diced, or riced. This recipe refers to the shredded version, which is the most common in many parts of the United States. Hash brown are considered a breakfast food, and are often served with ketchup. 1. Grate the raw potatoes with a cheese grater, place them into a bowl and cover completely with water. Let sit for 10 minutes. 2. Place a large frying pan on medium-high heat and add enough oil to provide a thin coating over the entire bottom of the pan. 3. Drain the grated potatoes well; if this is not done thoroughly the potatoes will steam instead of fry. 4. Mix in chopped onions by hand. 5. Mix the one egg OR two tablespoons of flour into the hash brown mixture evenly. This will allow the hash browns to stay together when frying. 6. When the oil has come up to temperature apply a large handful of potatoes to the pan and reshape into a patty that is about 1/4 in (6 mm) to 1/2 in (12 mm) thick. The thinner the patty the crispier the hash browns will be throughout. 7. 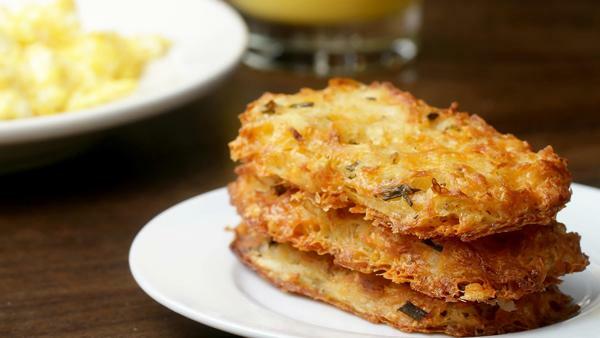 The hash browns are ready to flip when they are crisp and brown on the cooking side. They should also stick together nicely before they are flipped. This should take about 5 to 8 minutes. 8. The hash browns are done when the new side is brown and crispy. This should take another 3-5 minutes. Try using rosemary instead of the onion.